I've been addicted to Prismacolor colored pencils since high school, when I begged shameless as a puppy for a 72 color set. Up to that point I'd been a bit frustrated with colored pencils because most of what I used was hard student grade ones. Kid pencils are difficult for beginners. Skilled colored pencil artists can do a lot with any level of hardness or softness, but the creamy, soft, easily blended Prismacolor texture gave me a new passion for the medium. That set also came with a little booklet showing colored pencil art by some serious professionals. The cover painting was a realist landscape with reflecting water, trees, clouds in the sky, all done so well that it was better than a photo. I finally understood what could be done with colored pencils and spent the next 40 years learning to do it myself. This set, the 24 color Portfolio set, is darned convenient. It comes with a good sized pad of heavy white paper, a manual sharpener, a padded faux leather portfolio that protects the delicate pencils well and a pocket in the front for storing your finished art. So this one is my take-along set. The range includes Indigo, one of my all time necessity colors. So does the 12 color Portfolio set. Either of these is a good bargain on sale, because the case is well worth it to protect these frustratingly delicate pencils. Prismacolor colored pencils are also the worst offenders for internal breakage. That's what happens when you get a new replacement pencil from the store, start to sharpen it and the point falls off. You sharpen it again and the point breaks off as it's almost sharp. Repeat until pencil is a tiny stub shorter than the one you decided to replace. Bang head on desk a few times, return to store, get another one from open stock. Every art supply store or online supplier I've ever bought them from will replace those internally-broken Prismacolors without charge. They know that happens. I found out by trial and error that open stock pencils ordered online are less likely to have internal breakage before I even sharpen them the first time. Possibly they're handled less because of the sheer volume of orders. What happens is that the very soft core of the pencil cracks inside the wood case. You can't tell there's anything wrong with it until you start to sharpen it. This can happen because you dropped it. Think about how many times display racks in stores fall over and employees pick everything up to reshelve it. Before you bought the open stock pencil, a seven year old may have played Pick Up Sticks with the display. This is why I always keep Prismacolors and other soft colored pencils in elastic band cases, preferably padded ones. The portfolio sets have elastic bands to hold each pencil separately so they don't bang into each other. Prismacolor tins are a bit too large, when you tilt them or hold them on end all the pencils jump out of their styrene trays and bang into each other. That causes internal breakage and it can happen before you even get the shrink wrapping off the new tin to sharpen any of them. However, Blick and other suppliers will replace any damaged pencils from a set if you email them to tell them what's missing or damaged. Nearly every time I've gotten a large set, I've had to email them for one to half a dozen specific colors that had internal breakage. The newer tins have been redesigned to help solve the problem. The big 132 color tin has a lid over the top stack and all the trays snap together, so that tin is actually safe for your set. I still moved mine to elastic band leather cases because they're also easier to get at in those cases. I'll do a review on the cases later on in more detail. It's just important to remember that some type of elastic-band case is a necessity for Prismacolors because of their fragility. It's also absolutely necessary to use sharp new pencil sharpener blades. Prismacolor makes a special Prismacolor Colored Pencil Sharpener that has some advantages, it's a little gentler on them than normal ones by its design. Just replace the blade often, as soon as it's at all hard to turn the pencil it's time for a new blade. A good alternative is an electric or crank grinder style sharpener. Those are self sharpening and don't eat Prismacolors nearly as much, but still take some care. You need to run a normal cheap HB pencil into the sharpener after every half dozen to a dozen Prismacolors so that the grinder doesn't get gummed up with the soft waxy formula. Also empty the shavings receptacle often. Either stuffed-up receptacles or wax jamming can cause problems with these fussy, overly-delicate pencils. Not all the colors in the range are lightfast. If you're concerned about lightfastness, do a home lightfastness test. Make two labeled charts with all the colors. Tape one into a sunny window for a year. Leave the other one safe in a closed box in the back of your closet or somewhere else dark and safe. Then compare them for how much each color faded and you'll know which colors to use only for projects that won't be exposed to light much or don't need to last a long time. Sanford also makes Prismacolor Lightfast colored pencils in a shorter 48 color range. Happily these have the same sweet Prismacolor texture, so if you don't mind having fewer colors to work with, you can get good archival paintings done with them. If you aren't as worried about lightfastness, the Premier Lightfast range with the Aztec mask on the tin has different colors. Everything but black, white and lemon yellow is unique, so it'd extend your range a lot. So why, after all those troubles, do I still keep coming back to Prismacolor colored pencils like an old friend? They are available in more colors than any other colored pencil. They have a unique soft easily blended texture that's glorious for doing layered realistic painting. They're pigment-rich and strong too. The amount of time and effort that goes into a 20-30 layer realist Prismacolor painting on a good archival support is worth buying museum glass for the frame. All colored pencils have different binders. Every manufacturer has proprietary colors and proprietary binders. Like pastels, the more colors you have, the more colors you want. Even when you start mixing colors, a large range gives more possibilities -- you want to glaze a light blue over a bright orange area, but the one that's the right color is too dark. I actually use all of the colors. I started tracking this when I wondered if I was buying a lot of colors I didn't use. Then I realized that what wore down fastest was just the colors that often get used for large areas -- some colors I only use for details, others I have to lay down repeatedly to cover skies and foliage. Blues, darks and greens wear down the fastest for me, your mileage may vary depending on your favorite subjects. Prismacolor's specific translucence is perfect for a multi-layered, rich, shimmering color. Some prominent realist colored pencil painters like Alyona Nickelsen only use Prismacolors for their effects. Others combine multiple brands but keep coming back to Prismacolor for its range, its texture and its exact translucence. Another good point in their favor is the price -- they're often on sale and even at normal prices run a bit lower than many other brands. These pencils are also the easiest artist grade brand to find in the USA. You can get them online or at any brick and mortar art store. If you are in the UK or anywhere in the British Commonwealth, you may find them marketed as Karismacolour or Karisma Colour, those are exactly the same product under a different label. This is the best Prismacolor painting that I've ever done, from a photo reference in Arlene Steinberg's book Masterful Color. 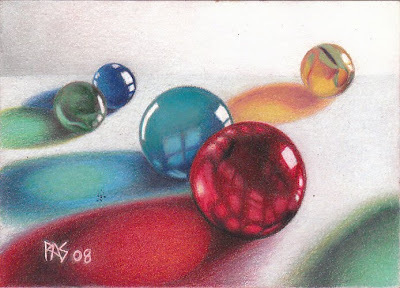 I used Ms. Steinberg's techniques including complementary underpainting and took my time with it, using 30+ layers on some of the marbles and at least seven or eight on the background areas. The luminosity of this painting in person is indescribable. If you look at her book you'll see many incredible paintings, but if you try one of the projects you'll understand why so many professional painters still come back to Prismacolors like an old friend. They give a special glow and are one of the best brands for that multi-layered super realism style, where your art comes out looking truer than a photo and just as detailed. Colors mix well by blending, glazing and burnishing. Prismacolor also makes a Colorless Blender that's tremendously useful if you just want a thin burnished layer without changing its hue. You can also burnish with White, but that takes going over it again with the previous colors to darken it up again. There's an extra loop in the spine of the Portfolio sets if you want to add a colorless blender to make the small set complete. These classic pencils are still among my favorites despite all their troubles. Give them a try, especially if you're new to colored pencils. You'll find it a lot easier to get these effects than if you're struggling with student grade pencils or a harder artist grade brand like Derwent Studio or Prismacolor Verithin. Those have their uses, but the soft pencils are the best for blending smooth flat areas of color, covering thoroughly and layering for rich luminous effects. Hey Robert. Just over from WC. Those marbles look great. Worth the labor. Thanks, Jake! Oh yes. They're even better in life. Arlene Steinberg's method gives a sizzling luminous brilliance to anything she does. Trying to decide between the Prismacolor and Faber-Castell Polychromos. Both get good reviews...any thoughts on why you might recommend one brand over the other? 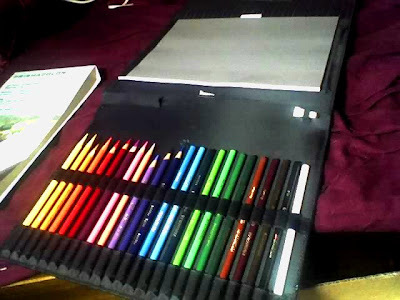 Where can I obtain a case that has elastic bands for Prismacolor pencils? I could not find one on what I thought was your store site. I just bought a package of 12 of the water soluble pencils. Three were split down the entire length of the pencil. What a waste of time and money. Made in Mexico, the quality control is terrible. Can't return them to JoAnn's because they are open, but I am going to try.